One accident can change your life forever. A defective crib attorney can help you get back on track. Baby products such as cribs, high chairs, and car seats are a necessity for any parent with a child. Unfortunately, baby products present potential hazards and risk of injury to the most precious people in our lives. From bassinets and high chairs to monitors and cribs, it is important to keep your child safe with properly designed and manufactures products. That being said, parents must understand that even the most cautious of caretakers cannot avoid all accidents. This is particularly true when it comes to defective baby furniture such as cribs. Baby cribs are an important and essential piece of furniture for a growing family. Defective baby furniture can cause serious injury or even the death of a little one, and defective baby cribs are no exception. The U.S. Consumer Product Safety Commission (CPSC) has had to recall several baby-related products, including defective baby furniture such as cribs. A national study revealed that as many as 10,000 infants and toddlers suffer defective crib injuries every year in the United States. Many of these injuries are due to drop-side cribs with side rails that move up and down. The rails have the potential to become partially detached, creating a gap between the mattress and the railing. Infants are at the risk of getting stuck in the gap and suffocating. As a result, millions of drop-side cribs have been recalled. If your child or a loved one’s child was seriously injured because of a defective baby crib, you should contact a knowledgeable and experienced Nevada baby crib accident attorney. You and your family may be entitled to monetary compensation for harm suffered due to a defective baby crib. Defective baby crib lawsuits fall under the area of product liability. A defective product is one that causes damage, injury, or death to a person as a result of a defect in the product’s design, a defect during the manufacturing process, or a defect in its marketing. Product liability cases are decided not only on whether there was an injury from using the product but also whether the product itself was defective or unreasonably dangerous to the public. A manufacturer, seller, or other entity involved in the chain of commerce of the defective product may be held liable for injuries arising from its use. The standard of proof in product liability cases is often strict liability. This means that an injured party does not need to establish fault in order to win the case. Rather, he or she must prove that the product was defective, that it caused an injury, and that the injury happened because of the defect. Notably, the original owner of the product is not the only one who can file a product liability claim regarding a defective crib. Someone who was injured while using the defective crib can also file a baby crib lawsuit, if the injury was caused by the defect and the injury was foreseeable. Manufacturers and retailers of baby products owe a legal duty of care to provide products that are safe for consumers. 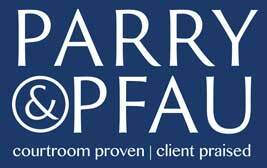 If your family has been harmed by a defective baby crib, the knowledgeable personal injury attorneys at Parry & Pfau can help. With years of experience protecting the rights of the injured in Henderson and across Nevada, these skilled baby crib accident attorneys can guide you every step of the way. Click here to schedule your initial case evaluation.